Rob Tillett presents a short description of the astrological meaning of the planet Jupiter, the greater fortune, law-giver, cosmic joker, healer and ruler of the higher mind. Jupiter, the ruler of the ancient gods, is a giant self-illuminating planet, the centre of a mini-solar system of his own (Jupiter has over 60 known moons). A massive force, he radiates more energy than he receives, in keeping with his role as lord and teacher of the gods. Ju-piter ("Father Iu") as he was known by the Romans was called Zeus by the ancient Greeks. Zeus also became deus (God) in Latin, but the origins of the name are from Sanskrit, the elder tongue of the migrating Indo-European peoples who eventually populated both Europe and India. Jupiter was Dyaus-pitar ("Sky Father"), the original creator. Traditionally described as the "Greater Fortune" (or "Greater Benefic", Venus being the "Lesser Benefic"), Jupiter governs joy, luck and wellbeing. When well-aspected, he provides superb opportunities for expansion and success. Poorly aspected, he generates over-confidence and foolhardy actions with little care for the consequences—so we always need to look very carefully at his gifts. 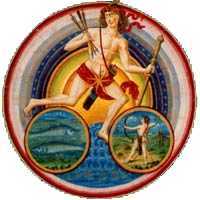 Planetary lord of Sagittarius, his day-sign and Pisces, his night-sign, Jupiter is masculine, disciplined, co-operative and priestly. He rules our potential for growth and expansion on many levels: physical, intellectual, spiritual and cultural, along with the accumulation of material assets, power and status. Exalted in Cancer, healing Jupiter describes our optimism and aspirations, but he also rules cultural pursuits, religion, powerful males, government and matters of state. In this sense, Jupiter stands for leadership and the rulers of the community, as his domain covers high officials, bishops, kings, generals, presidents, princes, business moguls and the like. Heads of organised structures, rather than individual heroes. Jupiter also governs our interests in faraway places, travel, foreigners, academic and artistic types, cultural endeavours such as publishing, higher education, structured personal development, healing, government and religion. Jupiter is a risk-taker, so also rules gambling and speculation, adventure—and moving into unknown territory. This massive planet spends about a year in each sign, taking twelve years to complete the journey through all twelve signs. He turns retrograde once a year for 120 days, being stationary for some 10 days. Jupiter's transits set the stage for the performance of the year, year after year. His colour is royal blue and his gem is the yellow sapphire. Ancient astronomers, starting at least with Pythagoras, held that the Earth was the centre of the universe and that the planets and stars occupied positions in a series of concentric, crystal spheres surrounding the Earth. Each sphere corresponded to a note in the musical scale. The spheres rotated and the subtle sound generated was called the Music of the Spheres. By attuning to the music of the spheres one could place oneself into harmony with the cosmos. The music of the spheres is more than a beautiful poetic intuition. The dynamics of the solar system, first laid bare by Kepler's mathematical genius, are directly analogous to the laws of musical harmony. Interestingly, modern scientists have determined that planets broadcast unique radio signal patterns, which when translated into audible frequencies, make good listening. Thus planets could be said to "sing". Check out the "Sounds of Jupiter", recorded by the Voyager mission. If the embedded sound controller does not show on your browser, click here to listen to the "Sounds of Jupiter". Or check out the video below! Jupiter entered Aries on January 22, 2011 and hotfoots it through this fiery sign until June 4, 2011, when he strides on into Taurus. Check out Jupiter's transit through Aries. Jupiter entered Pisces on Jan. 18, 2010, moving to Aries temporarily on Jun. 6, then back to Pisces on Sep. 9. Check out Jupiter's transit through Pisces.